Pasquatank Riverfront Paradise! Approx. 575 ft. of bulkheaded river frontage. 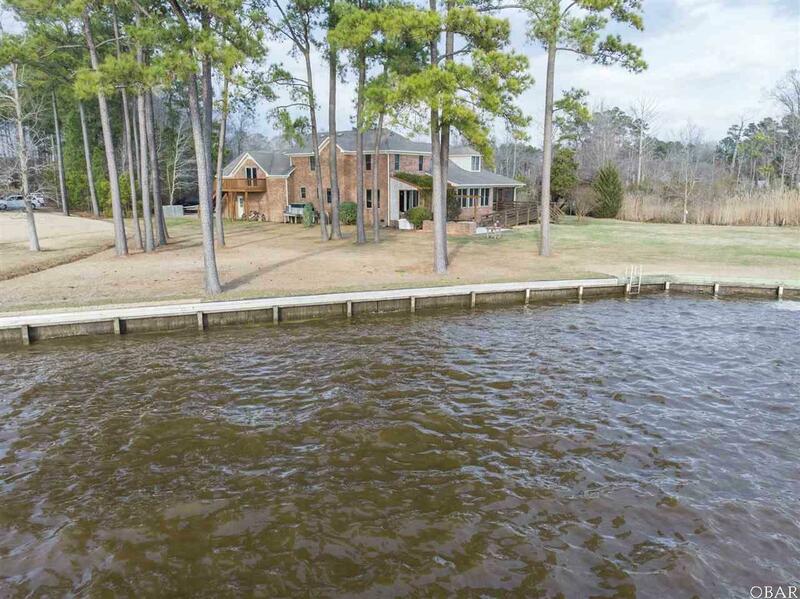 Fabulous water views! Beautiful, custom built brick home by Norman Meads has 3923 sq. ft. of living area, 3 car garage on 6.7 acres. Home is on 1.81 acres, 2 other parcels of 3.75 acres and 1.10 acres combine for 6.7 acres total. Small boat launch ramp. Bright open floor plan. Pella windows throughout. Large 17 X 17 kitchen with Amish built hickory cabinetry, over size breakfast bar, pantry. Laundry room off the kitchen with shower. Water views from every room downstairs. Master suite is 34 X 14 including large master bath with double vanities, large stand up shower, jetted tub, 2 walk in closets. Spacious 21 X 22 great room with wall of windows to maximize views, electronic/manual hurricane shutters for wall of windows. Nice size dining area. Great patio area with brick bbq overlooking the water. 3 car garage. Nice screened porch, ramp. Upstairs has 2 more spacious bedrooms, full bath with double sinks, office/study and huge 34 X 23 finished room over the garage. Room over garage has staircase to the garage and private outside entrance and large sun deck. Optional Room 2 Size: 16x14 Ofc.